Now that we have setup an allinone deployment of the Acropolis OVM, configured networking, and an image registry. 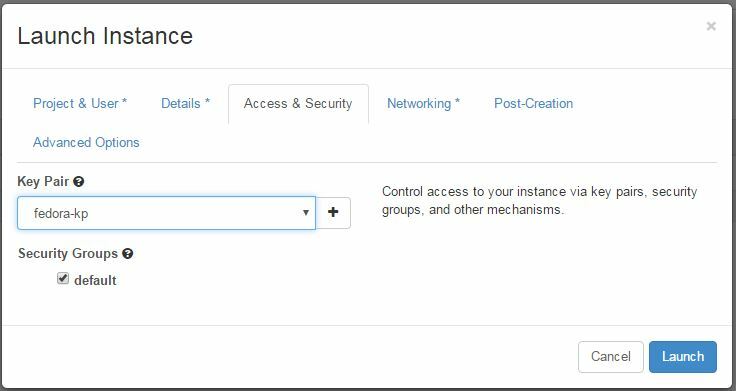 It’s time to look at the steps required to launch virtual machine (VM) instances and setup appropriate storage. The first steps to take are to provide the necessary network access rules for the VM’s if they don’t already exist. 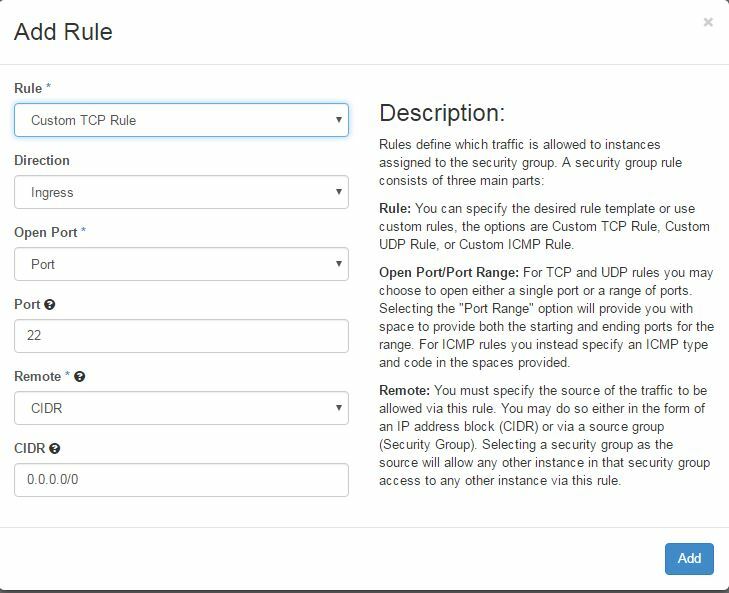 The easiest way to do this is to create rules to ensure SSH (port 22) access from any address range and to make the VMs pingable. Next create an SSH key-pair that can be assigned to your instances and subsequently control VM remote login access to holders of the appropriate private key. I will show how this is used later in the post, when we launch an instance. 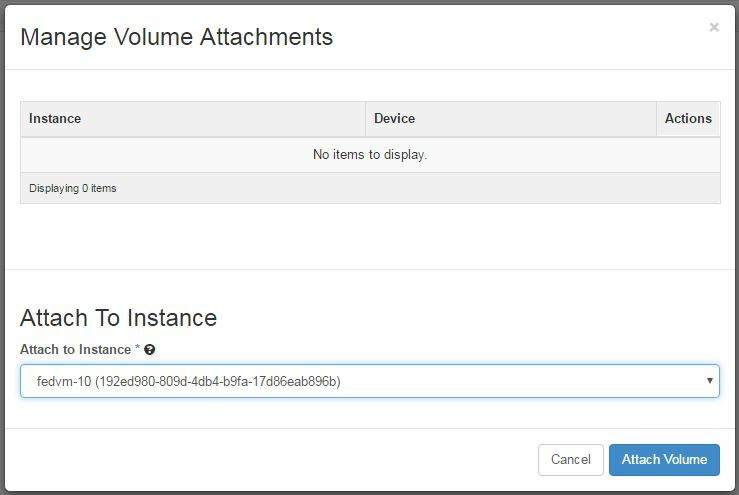 First, select the Key Pairs tab in the Access & Security frame and save the resulting PEM file to be used when accessing your VMs. Create a named key-pair (for example fedora-kp) for the set of instances you will create. As an example, I am going to create a single volume using the Cinder service, in order to show we can attach this to a running VM. In this instance, Cinder gets redirected to the Acropolis Volume API and the subsequent volume gets attached to the instance as an iSCSI block device. 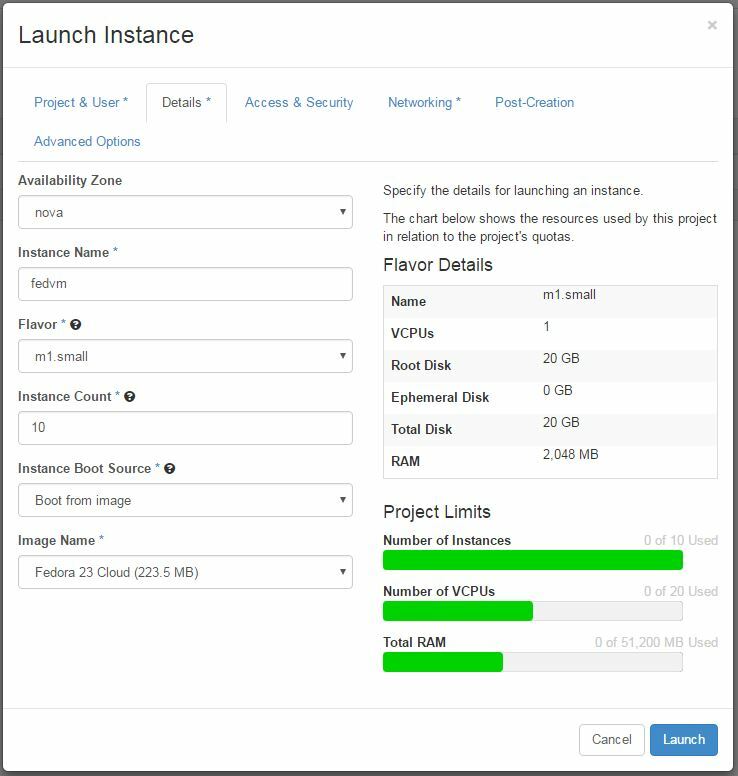 Next step will be to spin up a number of VM instances, I have given a generic instance prefix for the name, and I am choosing to boot a Fedora 23 Cloud image. You can see the Flavour Details in the side panel in the screenshot below – Note the root disk size is big enough to accommodate the base image. At this point I can go ahead and launch my instances. 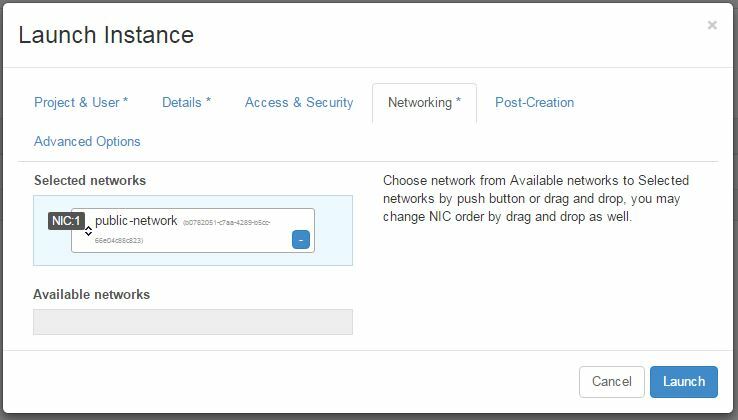 We can see the 10 instances chosen all get created below, along with the assigned IP addresses from the already defined network, the instance flavour, and the named key-pair …. So now, if we were to take a look at the Nutanix cluster backend via Prism, we can see those VM instances created on the cluster and how they are spread across the hypervisor hosts. That’s all down to Acropolis management and placement. 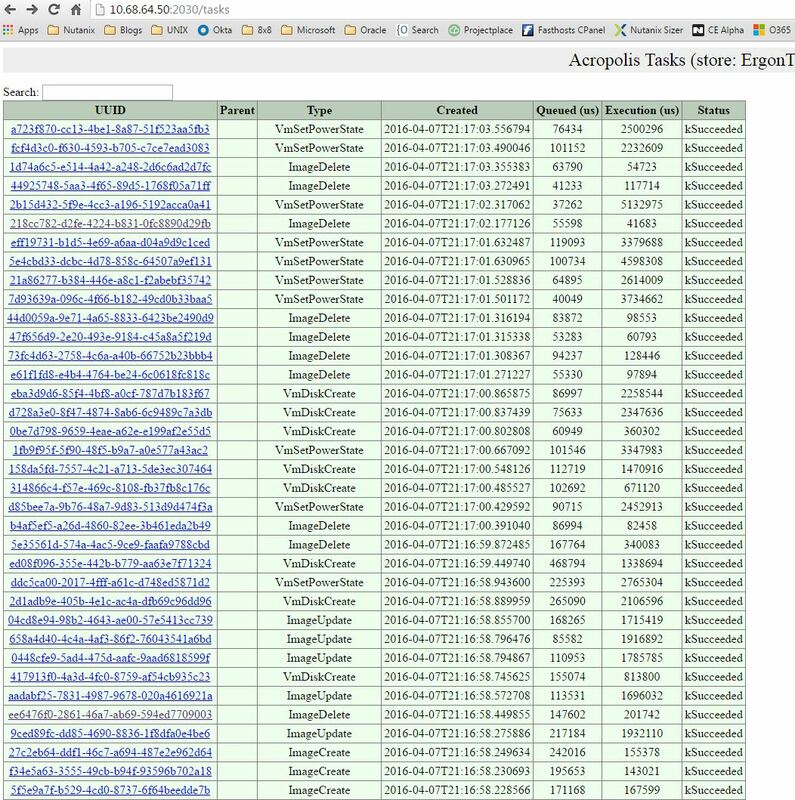 We can dig a little deeper into the Acropolis functionality and show how each of the steps taken by the Acropolis REST API calls have built and deployed the VMs on the backend. Here’s the list of VMs that were created as defined in the http://<CVM-IP>:2030 page. And we can see the breakdown of the individual task steps and how long each one took and how long they might have queued for, and if they were ultimately successful and so on. The key take away from all this is that the speed of creation of the VM instances is largely down to the Acropolis management interfaces consumed by the REST API calls. 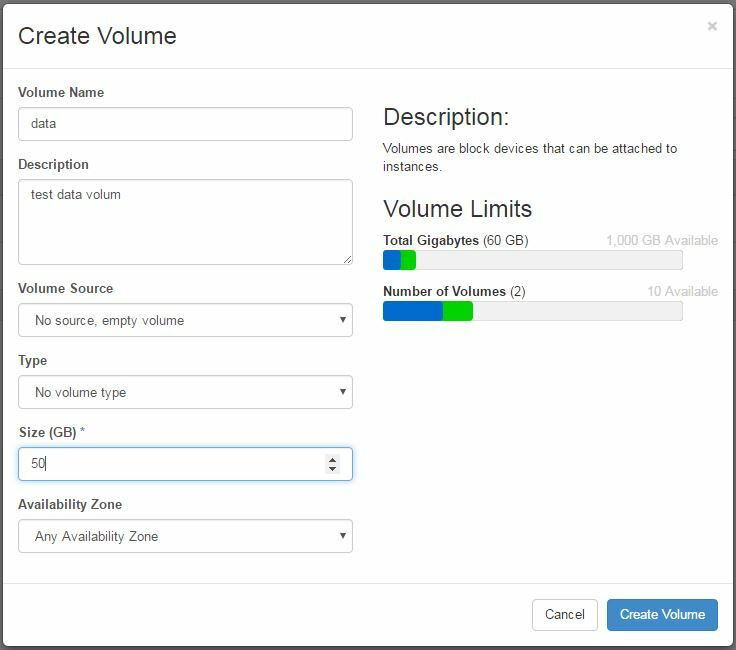 Then we can attach the volumes to the VM instance …. We now have the two volumes attached to the VM …. The two volumes should show up as virtual disks under /dev in the VM itself. We can verify this by logging into the VM directly using the private key I created earlier as part of the key-pair assigned to this series of instances. So from here, we can format the newly assigned disks and mount them as needed. That’s it for this post, hopefully this series of posts has gone a little way to clarify how a Nutanix cluster can be used to scale out an Openstack deployment to form a highly available on-premise cloud. The deployment of which is radically simplified by using Nutanix as the Compute, Volume, Image and Network backend. In future posts I intend to look at deploying an upstream Openstack controller, have a play around with snapshots within Openstack and their use as images. Also, some additional troubleshooting perhaps. Let me know what you find useful. This entry was posted in Acropolis, AHV, Cloud, DevOps, Openstack and tagged Acropolis, AHV, API, availability, Cinder, Cloud, compute, DevOps, fdisk, flavor, instance, iSCSI, Nova, Openstack, Openstack Controller, Openstack Services, port 2030, REST, Scale out, security group, ssh keys, upstream, virtual disks, volume, volume attach on 27th April 2016 by Ray Hassan.